Last month, my family celebrated Canadian Thanksgiving, which falls on the first Monday of October, almost two months before the American holiday. We indulged in a delicious meal of stuffed turkey, cranberry chutney, mashed potatoes, broccoli casserole, and green beans. As delectable as all that was, in our family, the favorite part of Thanksgiving dinner is the pumpkin pie we make for dessert. When I was a young housewife, I used the recipe that was printed on the label of the can of pumpkin puree. It was tasty enough. One year, however, my sister found a recipe that produced, by far, the best pumpkin pie we’d ever eaten. It was spicy, rich and creamy, yet light enough to not overwhelm after a heavy meal. Its creaminess is due to a secret ingredient. My daughter, who married last year, has made the pie frequently for various potlucks and dinners, always receiving rave reviews about its creaminess. It was not until we were baking it together last week that we realized a mix-up in her reading of the recipe resulted in an even better pumpkin pie. The confusion was about the amount of the secret ingredient. “Why did you cut the cream cheese slab in half?” she asked as we were prepping our ingredients. Perplexed, she checked the cream cheese wrapper, then the recipe. Mild surprise reflected in her eyes, then she smiled. Among all that I am thankful for (and there’s a lot! ), is the fact that my daughter misread a recipe. In bowl, mix flour with salt. Using pastry blender, cut in butter until mixture is in fine crumbs with a few larger pieces. In liquid measure, beat egg yolk with lemon juice, mix in enough ice water to make ⅓ cup. Drizzle over dry ingredients, stirring briskly with fork to form ragged dough. Press into disc. Wrap in plastic wrap and refrigerate for at least 30 minutes. On lightly floured surface, roll out pastry to ⅛-inch thickness. Fit into 9-inch pie plate. Trim edge to leave ¾-inch overhang. Fold overhang under and flute edge. Prick with a fork. Line the pastry shell with foil; fill evenly with pie weights or dried beans. Bake in bottom third of 375 F oven for 15 minutes; remove weights and foil. Bake for 10 to 12 minutes longer or until pastry just starts to turn golden. Meanwhile in food processor or blender, puree together pumpkin, sugar, cream cheese, whipping cream, eggs, flour, cinnamon, vanilla, ginger, nutmeg and salt. Pour into pie shell; bake in bottom third of 350 F oven for 1 hour or until set around edge and slightly jiggly in center. Let cool on rack. Whip cream with sugar to taste. Pipe or spoon on top of pie before serving. Pssssst! Did you notice our new look? 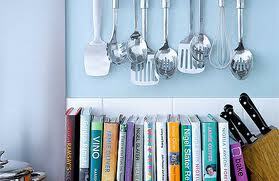 Lucy Arlington is an avid reader, cook, and gardener. If she had her way, she'd divide her time between preparing delectables in her kitchen, traveling the globe on her scooter, and sitting in a comfortable chair with a cup of coffee and a paperback until her legs cramped. Lucy is devoted to her husband and children - especially when they ply her with chocolate and gift cards to bookstores. Lucy’s first cozy mystery, set in a North Carolina literary agency called A Novel Idea, will debut late 2011. I love the new look with the new banner. Makes me feel like having a cup of hot chocolate and a book on this cold morning. I like the new look. Very cheery. And this recipe might just find its way into our Thanksgiving dinner this year. Thanks. Welcome Lucy love the recipe and I really like the new look the banner does make it cozy. Welcome Lucy!! I noticed the new look right off. It looks great!! I'd love to try your pie, thanks for the recipe! First Welcome Lucy, that recipe looks great will have to try it. Second LOVE the new banner. Thanks for making me feel so welcome! I'm honored to be blogging with the Cozy Chicks, and look forward to sharing my favorite recipes with you! I would gladly eat this pie for breakfast! Welcome, Lucy! I've got to try this recipe! Pumpkin pie is one of my favorite foods. It is a pleasure to welcome you Lucy, an author, fellow reader, cook and avid traveler. How can Cozy Chicks go wrong with you. Ive been making pumpkin pie all wrong all these years! Thanks, Lucy - you are a welcome addition here. Love the new look. Lorna, is that beautiful picture your work? It's perfect - cozy and inviting. Welcome to Lucy, and I'm with Dru, LOVE the new look! Welcome Lucy...yummmy pie, must try it...love the new look of the blog.. Welcome to the Chicks, Lucy! The recipe sounds delicious. Can't wait to give it a try. I LOVE pumpkin pie. Welcome, Lucy! And thank you for the recipe - the best accidents taste the yummiest. I'm looking forward to trying this one. The new look is great. Definitely cozy. 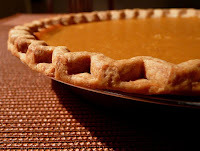 I love pumpkin pie and I have to try out your recipe! Yum, and extra creamy too! The new look is great! I feel like pulling up a chair, book and staying a while. Welcome Lucy!! I love the new look of the blog and this recipe...oh my, oh my, oh my!!!!!! We all love pumpkin pie here and I'm excited to debut this one this week!!!! Love the new look! Love the sound of the recipe and can't wait to try it. Thank you!